A dental veneer is a thin, protective, and esthetically-pleasing layer of material placed over a tooth. The main purposes of veneers are to improve the esthetics of a patient’s smile, eliminate small gaps between teeth, and/or protect the tooth’s surface. Although a few different material options exist for veneers, the most common material is porcelain. Porcelain veneers can be fabricated to mimic the fine intricacies of our natural teeth and can provide an absolutely incredible improvement to a patient’s smile. 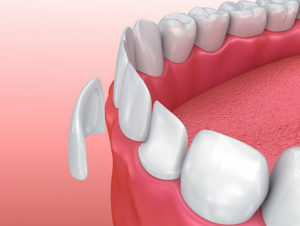 Before placing veneers, minimal tooth structure (usually limited to just the enamel) is removed to allow thickness of the material to fit onto the tooth. Once a dental impression is made and the veneer is fabricated, the dental veneer is bonded to the tooth. Like all restorations, it is very important that a smooth transition from tooth to restorative material is present so that dental hygiene is not hindered. However, not everyone is best suited for dental veneers when seeking to improve esthetics. For a patient who has minor imperfections in their teeth, a more minimally-invasive and relatively inexpensive option of cosmetic dental contouring (cosmetic filling or shaping of tooth) may be recommended. This option does not take much time to complete and removes little tooth structure from the healthy teeth. If a patient has crooked front teeth, dental veneers are not a substitute for braces or orthodontic work. Although the appearance of minor “crookedness” can be eliminated through dental veneers, braces or orthodontic work should almost always be considered first. For a patient who is seeking dental veneers in order to have whiter teeth, teeth whitening procedures should be discussed beforehand. Teeth whitening can brighten the shade of the patient’s teeth inexpensively and requires no removal of tooth structure.